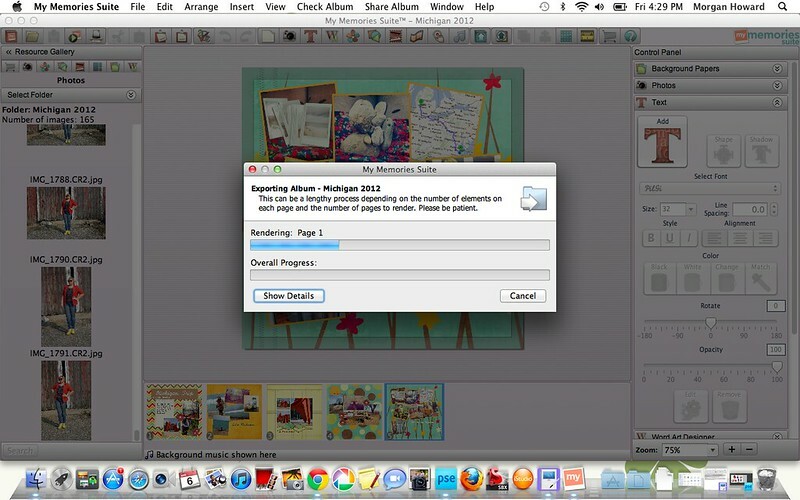 While I was on our trip to Michigan, I was contacted by MyMemories.com about reviewing their scrapbooking software. I've never been big on scrapbooking mainly because the papers & doo dads are too pretty to cut & use in such a permanent way! I did a bit of scrapbooking in middle school & that was the last time I'd played with it. A digital option seemed like an awesome idea: I could use all the paper I wanted with out it running out, there was no permanent cutting & pasting, and I'd have a digital copy to email, make a video, or print. Awesome right? But then I thought 'Isn't digital scrapbooking for like moms who want to document their kids...I don't know about this...' Boy was I wrong! The best part about a digital option is that you get choices! 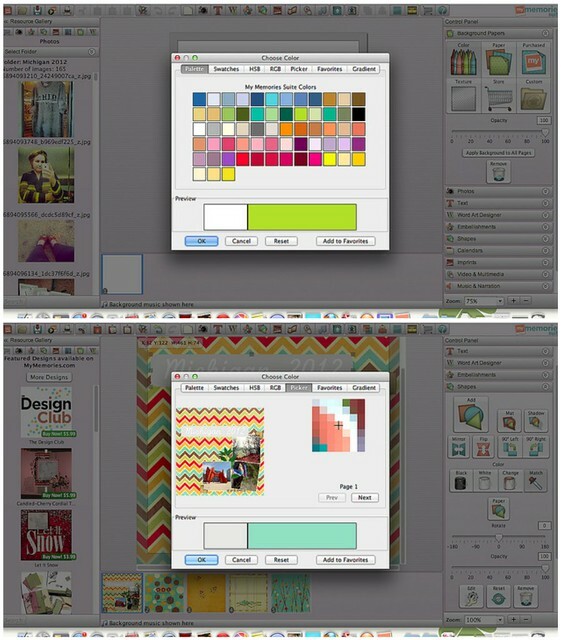 You can change, re design, & create your own layouts with a whole bunch of elements that match YOU! Downloading the software means you get a lot of papers & elements initially. But you can also purchase more sets or subscribe for $5.99 a month to their Design Club for access to sets. I've been considering doing that since each set has an individual cost that varies. I hate reading instructions! I try to figure things out on my own & this software is really easy for that. Everything is pretty straight forward from adding photos to picking colors. The left side bar holds the photos from the folder on your computer & the right side bar holds all the manipulations you can do. 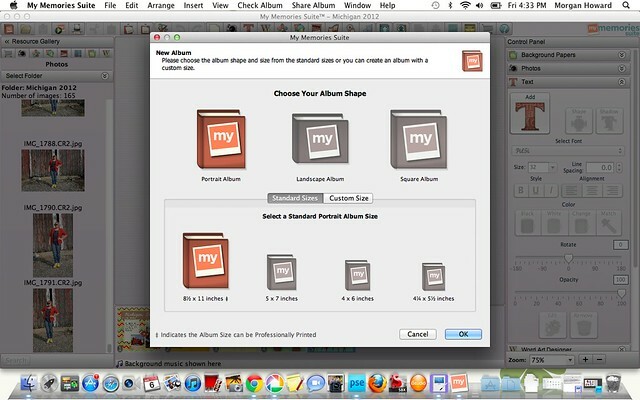 You can create albums in standard sizes or your own custom size. 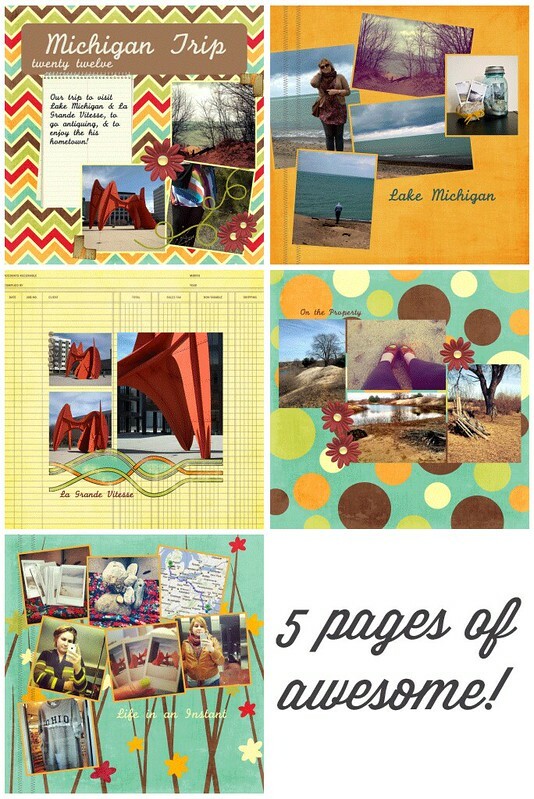 For my Michigan album I chose to create the standard square type of album. As a separate free download you can turn your albums into movies to upload on to youtube! This would be great for wedding photos, travel photos, etc...even great for school projects, like an alternative to slideshows. This is the color picker. My fave options are the palette & the picker. You can choose colors already existing in your album to create a cohesive look. PIck from the background colors to colors in your photos. Even from the decorative elements. You can see in the top image here that my photos are in the left side bar. The resource gallery also resides there. It's almost a simpler version of a photo program. It also took no time to create an album with my five pages. If you have more it may take longer, but I made a little video with more pages & it didn't take too long. I also made a little video to share with my family. So many ideas were running through my head about what this could be used for! Since the prospect of eventually moving to Michigan is looming, sharing our everyday life & our adventures with our families is going to be important. This digital software is a great outlet! Imagine a video of family reunion pictures, wedding pictures, travel pictures, or even a year sum up video you can put on a DVD & send with your xmas cards. Oh man, I'll have to save that one for this Christmas! Disclosure: I was contacted by MyMemories.com and compensated to for this review with a copy of the My Memories Suite. I will also be compensated through any purchases using the above discount code. All opinions on the software are mine & mine alone. I believe this product to be a satisfactory product & will continue to recommend it. I only support & recommend products that I feel are awesome. If you have any questions or would like to submit an item for review please visit the policies & disclosures page here. lol.... i did this giveaway too!